CSS Doodle: A Web Component for Drawing Patterns with CSS — A Custom Elements-based component that builds an internal grid of DIV elements and then populates them using CSS to create patterns. 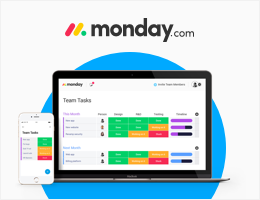 Plan Visually with a Single Glance and Make Sure Your Projects Get Done — monday.com is a project management tool your team will enjoy using. It makes it fun and easy for everyone to collaborate, focus and get more done. It's a visual project management tool that’ll help you and your team collaborate and achieve more. Don’t Use The 'Placeholder' Attribute — The ‘placeholder’ attribute populates an input element with temporary text to indicate what input is expected, but it introduces issues that prevent it from being as useful as it sounds. BEM For Beginners: Why You Need BEM — BEM is what we in the UK might call a ‘Marmite’ topic: people either love it and use it all the time or are disinterested in the idea entirely. CSS style isolation has value, however, and BEM can bring you more besides when it comes to structuring your frontend code. I’m still not convinced myself but this is a worthy attempt at showing BEM’s worth. Blink/Chrome Intent to Ship: Picture-in-Picture (PiP) — The Picture-in-Picture spec lets sites create a floating video window on top of other windows for media that’s left playing. Edge and IE11 To Support HSTS Preloading Using Chromium's List — For security conscious top level domains that are insisting on fully HTTPS-based usage. The Web Layouts of Tomorrow — How modern CSS can aid with building “unconventional” layouts. Can I Use 'grab' and 'grabbing' Values for CSS's 'cursor' Property? — In short, yes, all major desktop browsers support it. Don't Just Copy @font-face Definitions out of Google Fonts' CSS — Google Fonts serves up different code for different browsers. Use the code Google supplies and let them do the hard work. Creating More Neat Patterns with Unicode — Unicode characters + CSS can equal some very interesting designs. Augmented Reality for the Web with WebXR — A new WebXR AR API has been added to Chrome Canary to enable initial testing and playing about if augmented reality is your thing. Explore The New Frontier of CSS Animation — Grasp the best techniques to bring browser experiences to life. Teleport: Over-The-Air Hot Reloading and Debugging for PWAs — A dev-server proxy that enables instant hot reloading and debugging across devices. A Neat Container Query Flow Chart — “I need container queries!” Or do you..? Pickr: A Flat, Simple, No Dependency Color Picker — Live demo. It’s nice.